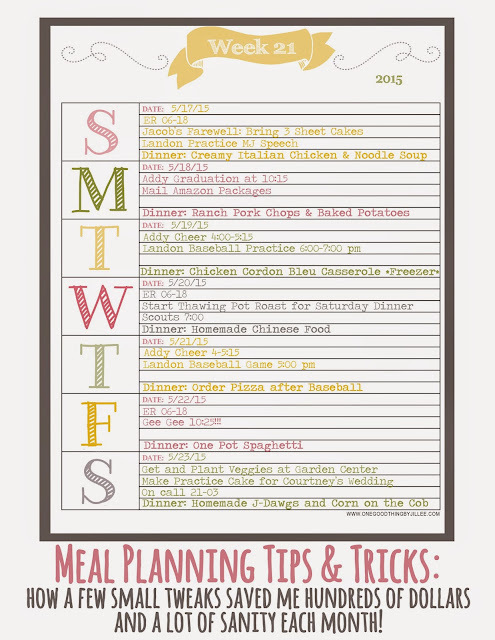 It's no secret in the blog-o-sphere that meal planning is a major money saver. Way back when I had my Kitchen Revival Blog (2010...where has the time gone?!) I explained that I literally cut my grocery bills in half by planning my meals, and avoiding extra trips to the store. Five years later, I still stand by the importance of planning your meals. But, five years later, my lifestyle has changed, and so have my needs for meal planning. Five years ago, I was a stay-at-home Mom of a pre-schooler and an infant, and my meal planning consisted of writing out whatever 7-10 meals sounded best to me, along with the ingredients I'd need, and any other incidentals. That was it. I didn't even have a calendar. Just an old fashioned spiral bound notebook numbered 1-10. I didn't assign each day a meal, because I didn't want to be too committed. I mean, what if I wasn't in the mood for meatloaf on Tuesday? What if I wanted chicken on Tuesday and meatloaf on Thursday? Committing those recipes to specific dates on a calendar felt way too set in stone. I wasn't a committer. I liked to keep my options (and my meat choices) open. And why not? I had all day to cook, bake, sew or binge watch Netflix. Okay, I didn't really have all day to binge watch Netflix, because we all know a 4 year old and an infant won't let you binge watch (or eat) anything. But, you get the idea. Fast forward to today, and I'm no longer a stay-at-home Mom to a preschooler and an infant. I'm now a part-time working Mom to a third grader, a Kindergartener, and an infant. My lifestyle now needs to accommodate school schedules, nap times, 12 hour ER shifts, baseball games, and cheer practice. I am now not only committed and scheduled, but probably OVER-scheduled, which means my meal planning needed to evolve. In fact, our lives had gotten so busy, that my meal planning had consisted of nothing more than occasionally pulling up Pinterest in the aisles of Walmart, or considering which restaurant drive-thru we should frequent on any given night. But my grocery bill, fast food bill, waistline, and nagging Mom guilt insisted that I needed a change. So now, I sit down each week on Sunday, and make a weekly meal planning page. 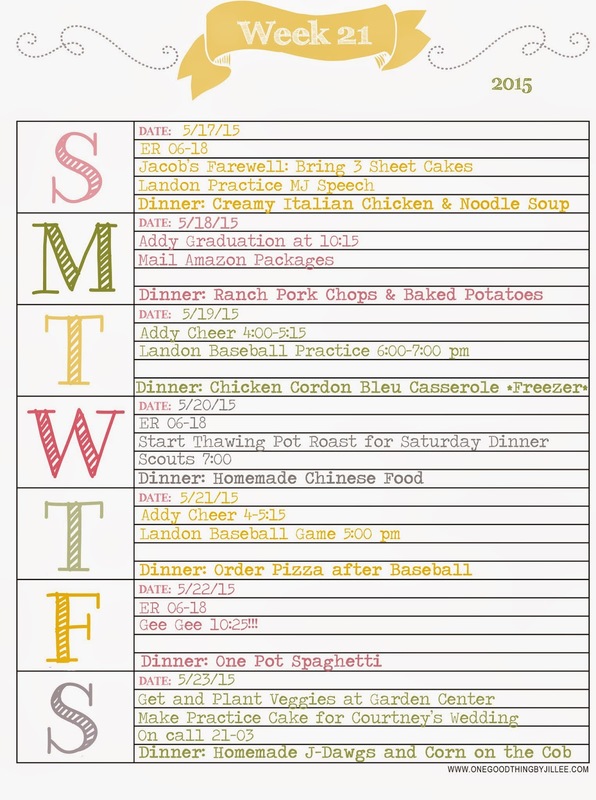 Each day is assigned a specific meal based on our plans and schedule. If I'm working a day shift, then I need a meal that I can either throw in the crock pot when I leave at 5:45 am, or one that I've previously frozen, and the hubs can just pop in the oven before I get home. If we have baseball and cheer, I might need to skip cooking and order a pizza. Planning my week like this has not only saved me time, but money, and I can't tell you how it's cut down on the food we waste. So many weeks when I was planning meals willy-nilly, the ingredients would spoil or go bad, because I had not taken the time to consider that I simply wasn't going to have the time to make a 3 course, two hour dinner that week. As usual, in my life, no matter how ridiculous it may be, I value form over function. Or rather, I value form as much as function. I knew if my meal planning lists were messy chicken scratches in a notebook, I'd never use them. I'm encouraged by things that are beautiful, and fun, and my weekly meal planner is no different. So, like any good copycat crafter, I scoured Pinterest for a planning page that would meet my needs. I stumbled on these awesome pages from Jillee, and knew I'd found what I needed. I did need to make a few tweaks though, since I start my weeks on Sunday, and her pages began with Monday, but 15 minutes in Photoshop, and I was in business. As far as the "Week 21" business at the top, because of my obsession with love for Project Life, I organize my life in weeks of the year. It's how I organize my digital photos, and personal journal, and since Project Life is about documenting your every day life, it was a no-brainer for me to include my meal planner in this method. It's fun too, because it will make it easy to pop this photo into a Project Life layout. How fun will it be to look back one day and see not only what we ate that week, but all of the activities we crammed into a week as well! Do you have other tips and tricks you use for meal planning? I'd love to hear about them in the comments section! In my very first blog post, I talked about the importance of looking for meaning in the smallest moments of our lives. In fact, I challenged each of us, myself included, to take the time to really see what was in front of us each day. I'm not sure if you were doing your homework, but I was doing mine, and I felt compelled to share my thoughts and experiences tonight. As with last time, inspiration struck at bedtime. Mine this time. Seems the only time my brain slows down enough to really take in these life lessons is when I'm too tired to drown them out. 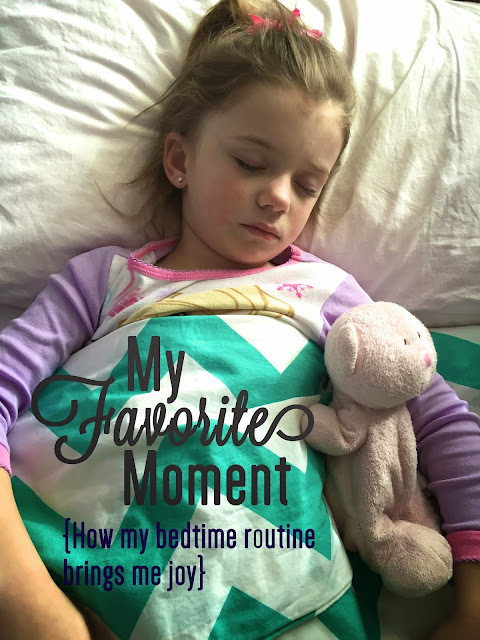 Each night, our bedtime routine is a little bit different. We don't have a one hour routine with a laundry list of steps, from bathtime to story time and everything in between. Sometimes the kids get a bath, sometimes a shower and sometimes they slip their tired and dirty feet between their crisp, clean (maybe?) sheets and we worry about it in the morning. Sometimes we have family book club. Most times we start a book together and never finish. Sometimes we have family meeting. Most times we have family prayer. There are usually tears. And trips downstairs for water. And dramatic requests to be tucked back in. Many times there are sleep walking trips to the silverware drawer, and extra cuddles. There is usually back scratching and bear finding. Some nights it's muskimo kisses, and others it's butterflies and lady bugs. There are "I love yous," and "I love you smaller bigs." Sometimes there are more tears. And occasionally, even some yelling; we are trying to improve that one, but what can I say? I'm human, and bedtime with three kids can feel like a battleground from time to time. As much as we would like more consistency, we just aren't there yet. But there is one routine that never changes. One that belongs to me. One that I take part in come rain or shine, graveyard or early morning shift, tears or tickles, every single night of the year. Every single year since Landon made me a Mom. A routine that (until now) no one even knows about. Each night, after the last tears are shed, the last laugh has faded into silence, and the baby has finished her last evening nursing session, I have my moment. I gently lay her in her crib, and head down the hall towards Landon's room. I usually find him sprawled out all over the bed. Sometimes he's barely still on the bed. At nine years old, it's getting a little bit harder, but I gently rearrange him. Moving dangling limbs so they won't tingle, adjusting pillows so his neck won't hurt, and pulling up the covers just so. I stroke his cheek and give him a kiss, knowing that soon, this will be the only time I'll get to kiss him at all. Soon, he'll be "too cool" for that. So I linger. I scan the room for anything that might be a danger, a scattered Lego in his path to the restroom, the sash from his robe hanging from his bed, too close to his precious neck. Satisfied that all is well, I sneak out, leaving his door cracked so the heat will get in, and so I know that I can hear him if he needs me in the night. One child down, I gently pad down the hallway, picking up toys, making sure the sink is off and the lid is down on the toilet, lest anyone drown while I sleep. Tonight, I notice that it's April and their mini Christmas tree is still up, with ornaments on the floor. I move them out of the footpath and make a mental note to get a tote and pack that away, marveling at how easy it is to stop noticing things we pass every day. I continue on and check the thermostat to make sure it won't be too chilly for Harper, who isn't yet old enough to safely sleep with a blanket, and then I head into Addy's room. I usually find her in the same position where she finally gave up the fight and fell asleep. Blankets just so, and any random permutation of toys lined up next to her in bed. I'm careful in here, and I have to move more quickly, since she's a much lighter sleeper than her brother. I work in opposite order. Clearing paths and removing hazards before I sneak up to her bed. I linger but a moment, risking a quiet hand on her chest, feeling the gentle rise and fall and the soft beating of her heart. I marvel at how peaceful she is, compared to the constant state of motion when she is awake. I often silently apologize for not being more patient with her antics, for I know one day, I will wish she needed me to scratch her back, or lay with her for just one more minute. If I'm feeling particularly brave, I bend down for a quick, soft kiss, and often she stirs, opening her eyes just enough to smile and drift back off to dreamland. Sometimes I even get a "love you Mom," or a slightly accusatory "you woke me up." Then, like any sane and responsible mother, I hightail it out of there before she's fully awake and we're all in trouble. Finally I head back into my room, where sweet Harper still sleeps in her crib. I begin to silently chastise myself for having a nine month old still in my room, but I know deep down, neither of us want it any other way. I carefully reach my hand down into the crib and rest it on her side, waiting for that reassuring swell of her tummy, letting me know she's still here, still safe and still at rest. I usually gently pull a foot from between the bars, or move a head from resting against the rails. I briefly consider rolling her to her back, but finally, at nine months old, I've come to realize those efforts are futile. So instead I stroke her soft, fine hair and utter a silent prayer that she will be safe and protected as she sleeps. Then, I take a deep breath and turn back to my bed. It is this moment I live for each night. This one moment in the long, and frenetic day that I feel totally and completely filled. In a brain that's always swirling with fears, and plans, and extraneous thoughts, I feel totally at peace. And more than that, I feel whole and content, and surprisingly, I feel powerful. I realize that as a Mother, there are so many times I feel powerless. Times when I can't predict their futures or be there to protect them twenty four hours a day. Times where I feel inadequate to the task, unprepared and terrified about the job I must be doing. But I realized tonight, walking back to my bed, that in these small motions, the gentle moving of body parts, the adept scanning and removal of anything that could harm them, in these stolen, secret moments of observation and reflection, of blanket adjusting and bear finding, I've found my strength, and my confidence. I realize that I've never felt more like a "real mother," than I do in these moments, in these motions, and what a feeling that is. In this moment, with Jonathon gently snoring in the background, I realize that I've got all I'll ever need. That in each other, we've all got everything we'll ever need. Within steps of our bed. You want to talk joy, and contentment? That is it, sister. In this moment, I feel joyful, and I feel content, and so deeply grateful. This moment is my favorite.